2016 Lowe FM 165 Poly Camo For serious outdoorsmen, the well-equipped FM 165 Pro Poly Camo packs all the amenities of the pro-spec FM 165 Pro SC into a stealthy hunting and fishing machine. Handle big water in a dry and smooth ride with super-durable Gator-Skin floors. Its a cinch to clean, and its ample storage holds all your fishing and hunting gear. See why CSI Awardwinning Lowe Boats is the right choice for serious outdoorsman who know what they want in a pro-grade, fish-ready, mid-sized camouflage package. Please note: This boat model may or may not be in-stock. A Nationally Advertised Price, if listed, may change without notice or include accessories not fully described herein. Please contact your local, authorized dealer for exact details on model availability and package pricing. 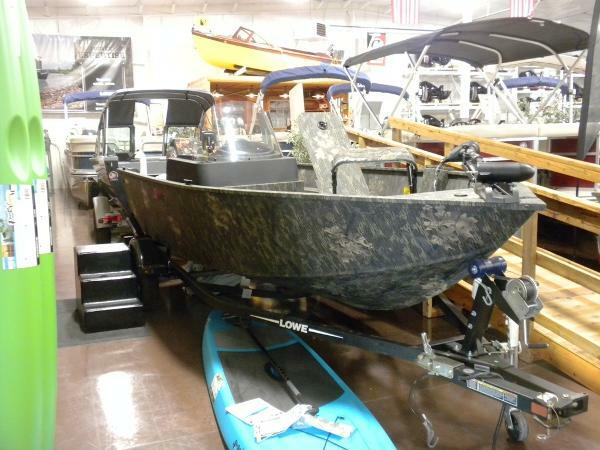 2016 Lowe FM 165 Poly Camo Lowe FM 165 Poly Camo 16' 60hp $18720.See this combo at our new location and Grand Opening Sale.Elephant Boys Boating Store14811 E SpragueSpokane Valley, WA.Sample Only Photo boat This Boat Combo comes with all standard features plus added Options below and priced after Outboard Factory Rebate -- OPTIONSCamouflage - Mossy Oak® Shadow Grass®60ELPT FourStroke MercuryLB-2200-70-17-ST-BLKAft Recirculating Livewell w/TimerLowrance Elite-3x Fishfinder (Console Mount) - Factory InstalledMotorGuide® X3-45FW FB (50"/45#/12V) Trolling Motor - Factory InstalledTransducer Bracket - Welded On (1 each)Rigging (Labor, Hardware, PDI, Oil, Battery, Prop)Deep Cycle Battery (insalled) For serious outdoorsmen, the well-equipped FM 165 Pro Poly Camo packs all the amenities of the pro-spec FM 165 Pro SC into a stealthy hunting and fishing machine. Handle big water in a dry and smooth ride with super-durable Gator-Skin floors. Its a cinch to clean, and its ample storage holds all your fishing and hunting gear. See why CSI Awardwinning Lowe Boats is the right choice for serious outdoorsman who know what they want in a pro-grade, fish-ready, mid-sized camouflage package. 2016 Lowe FM 165 Poly Camo For serious outdoorsmen, the well-equipped FM 165 Pro Poly Camo packs all the amenities of the pro-spec FM 165 Pro SC into a stealthy hunting and fishing machine. Handle big water in a dry and smooth ride with super-durable Gator-Skin™ floors. It’s a cinch to clean, and its ample storage holds all your fishing and hunting gear. See why CSI Award–winning Lowe Boats is the right choice for serious outdoorsman who know what they want in a pro-grade, fish-ready, mid-sized camouflage package. Please note: This boat model may or may not be in-stock. A Nationally Advertised Price, if listed, may change without notice or include accessories not fully described herein. Please contact your local, authorized dealer for exact details on model availability and package pricing. 2015 Lowe FM 165 Poly Camo IN STOCK!! AWESOME DEALS ON ALL REMAINING 2015'S IN STOCK!!! CALL US NOW!!! The well-equipped FM 165 Pro Poly Camo packs all the amenities of the pro-spec FM 165 Pro SC into a stealthy hunting and fishing machine. Super-durable Gator-Skin™ floors make it a cinch to clean, and ample storage holds all your fishing and hunting gear. Features include: Full-length heavy-duty extruded keelSprayed-in, skid-resistant Gator-Skin™ floor linerBlack console w/ tinted windscreen & soft-grip wheelPlug & play instruments (tack, speed, fuel & trim)MotorGuide® 45# 12V trolling motorLowrance® Elite-3x fishfinderDriver and passenger camo pedestal seats w/ pedestal seat bases (6)Bow fishing deck w/ 20-gallon aerated livewellAft fishing deck w/ 19-gallon aerated livewellLocking 7’ port, 7’ starboard and 6’6”-7’ center rod lockersFront & rear deck and starboard storageAvailable painted or galvanized bunk trailerCamo paint available in Mossy Oak® Shadow Grass or Mossy Oak Break-Up Lowe factory packaged boats are available with various horsepower Mercury® outboards. Standard equipment and options may vary from model to model.